Use a two finger twisting gesture to rotate your view. Tap Yellow tiles to open adjacent chests, loot corpses and open doors! Drag two fingers to pan your view. Tap the backpack icon in the bottom right to open your inventory. Tap any selected card to enlarge it for easy reading. WILDLIFE won't bother you if you don't bother them. Tap creatures, with no skill card selected to learn about them! Each skill card has a quality level from poor to elite. The higher the quality the better the card! Careful! Cards wear with use until they are no long usable. Gold can be used at shop to purchase rare upgrades. If you are wearing armor and it stops the enemy's attack, it will be shown here together with the enemy's cards. Cards come in 5 strength levels: Poor, Common, Fine, Superior and Elite. 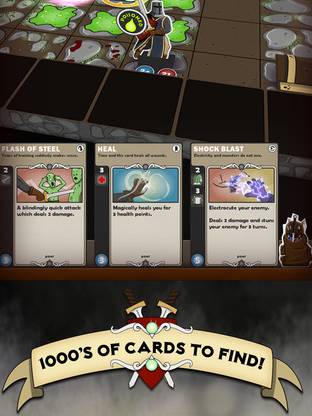 Each level adds strength to the effect the card does. All creatures have innate stats making them easier or harder to hit. Applying conditions after these stats. Equipping armor alters your own stats. Cards fade at a steady rate with use. Replace them before they deteriorate!